Several ofthe themes of this study have been treated in earlier publica- tions, some by means of a general analysis and some through a detailed handling of problems raised by a particular theme or historian. Both the more general theoretical treatment of the theme and the concrete historiographical treatment are, I think, indispensable aids to the proper understanding of the development of historical scholarship in nineteenth-and twentieth-century England. 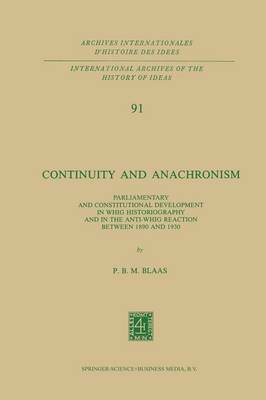 There are a number of problems in a concrete historiographical approach: there is first the mass of historians to be faced, and then the immense amount of historical themes dealt with in various periods. As a guideline through the tangle of themes we chose the historiography on the development of the English parliament. We can only hope that we have made a responsible choice of the historians concerned. Un- fortunately it was not always possible for us to give extensive biogra- phies of some of the more recent historians, as several 'papers' are still firmly in the possession of families, and a number of them mus- despite of years - still be labelled 'confidential.' The Pollard Papers in the London Institute of Historical Research thus remained inaccessible. Fortunately the lack was partly compen- sated by some important material being found apart from these Papers.